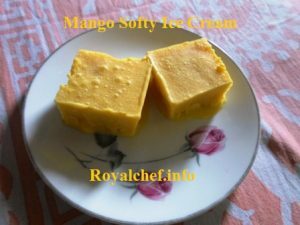 This is a easy to follow step-by-step Recipe for preparing at home soft, delicious and tasty homemade Mango Softy Ice Cream. A great ice cream for the hot summer mango season, however, tinned mango pulp can be used when fresh mangoes are not in season. For the Basic Ice Cream: Divide the Milk in a two equal portions. Keep a one portion of Milk to boil on a slow flame. In the other portion of Milk add the Corn Flour, G.M.S. 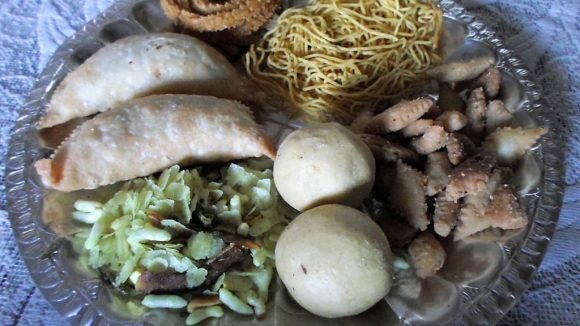 Powder, Sugar, Stabilizer Powder, Milk Powder and mix it well and pour it into the boiling Milk and mix it well and keep stirring the mixture for 5-7 minutes on a slow flame and then remove from the flame and keep it aside for cooling. After the mixture, cools down keep it into the deep freezer for setting for about 7-8 hours. For the Mango Softy: For home made Mango Pulp: Wash the Mangoes, remove the skin and cut in small pieces and blend them into a pulp in a blender. Mix the Basic Ice Cream, Mango Pulp, Fresh Cream, and Yellow Color and blend it in the blender for 5 minutes and then pour the mixture into an Aluminum container and keep in the deep freezer for 2-3 hours for setting.